We were pleased to add Italian brand Q36.5 to stores this year. We really rate the clothing and when we visited founder Luigi Bergamo earlier this year we got a real glimpse into what the brand is trying to achieve, and why it stands apart from other high-end clothing labels. Bib shorts are the most important piece of cycle clothing, they can make or break your comfort on the bike. It's no an area to skimp, we absolutely advise investing in decent shorts. We've always wondered how you set about designing bib shorts, so we sat down with Luigi Bergamo to find out. What sets Q36.5 bib short apart from the competition? 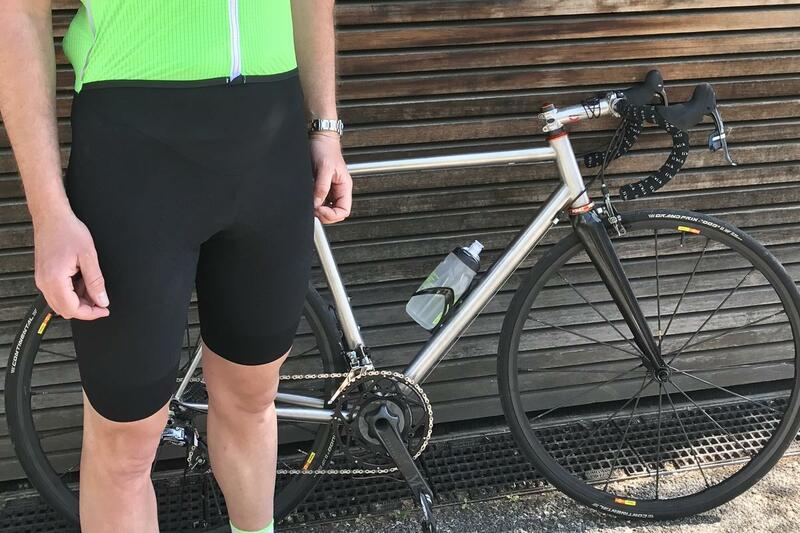 Q36.5 apparel is single minded, obsessive experiments into what cycling clothing can be if you work at the very forefront of sportswear technology. There is no 'fat' or decoration, just unrestrained experimentation and new ideas; take the products in your hands and you can begin to feel what the future of cycling apparel feels like, a completely new tactile experience. The best way to understand this different feeling is to try the equipment for a rider, you will notice immediate differences. What is the most important thing to consider when developing bib shorts? We start to consider the final consumer, for the use we want to design a bib short. Our products are dedicated to cycling connoisseurs, riders who can appreciate the different feeling. Starting from purity and essentialism of the design, we focus on lightweight performance fabrics, ergonomically cut, maximum comfort and ease of movement. Does everything start with the chamois? No! Because a bib short is a system of few components and the chamois is one, as are the straps, the lumbar area and the legs. You can't put the best chamois on a pair of jeans. How important is to develop your own fabrics? As we say Q36.5 is 'an extreme vision of modern cycling apparel' and this vision of the future, out of the scheme of the past, led us to have an obsessive research in textiles, developing a fabric specifically for the use we have in mind. Sometimes is just a fine tuning of existing fabric, sometimes a completely new development, to produce something which can adapt perfectly to our demands. What difference does the woven fabric make over regular Lycra? We were, since 2013, a pioneer in the use of woven fabrics, but we have upgraded the existing woven fabrics; we don't use a regular woven fabrics but a high density woven fabric made on special machine in order to have a super compact surface with super fine yarns, lightness more strength and robustness, to have a high elastic return rate, which isn't comparable with knitted fabrics. But at the same time, we are using high-grade knitted fabrics for other bib shorts where we would like to have a more democratic fit and feeling. We try to use both techniques from woven to knit to keep the both advantage. Is there performance to be gained with the use of compressive fabrics? We prefer to say we have designed supportive bib shorts rather than compressive, we use the modulus force of our fabric to enhance an active support to riders during the pedal stroke. The premise of compression apparel is that by compressing muscles, there are fewer vibrations transmitted from the road surface, correlated to less energy expended. We are more focused to create ergogenic bib shorts than compressive bib short, the characteristic of the compression or better the modulus force of the fabric are mean to arrive to create an intelligent piece of clothing that it is interactive with you. Our Salopette Dottore L1 has a gradual compression with four different progressive levels, to promote the venous return during the ride. Our 'king' of the collection not only gives a gradual compression, but we have properly oriented the weft and warp of the fabric (Italian woven polyamide 6.6) in order to use the stretch capabilities of the fabric to calibrate and synchronise with the moment in the pedalling revolution when the leg 'returns' to its uppermost position. The result is to have a better proprioceptively. This effect is the Vectorial Elasticity, which gives a structured ergogenic aid during the ride. All our bib shorts are designed with a lumbar support as well, it is a very powerful strength panel in the lumbar area in order to support better the muscles, this area is very strategic because all the muscles involved in the pedalling are "attached here." How do you make sure the bib shorts fit really well and fit a different range of body shapes and heights? We have the ability, internally here at Q36.5, to personally test on the bike the products in any weather conditions, because we are first cyclists, and then secondly we have a group of tester worldwide in order to find the most appropriate fit, which is the result of a long process. We continuously make some refinements to obtain a piece of equipment, like we are used to saying, something that you really need and that is necessary during your rides. Is there really a big difference between low cost and high-end expensive bib shorts? There are differences in the quality of the fabrics and accessories used to construct bib shorts. But in our Salopette's Collection we don't have a range of prices defined on low cost or expensive bib short; we decide to have different exploitation with the use of woven fabrics (for Salopette Dottore L1) and knitted fabrics (for Salopette Miles Gregarius) and this defines a different price to the final consumer, which can appreciate two different fits, but with the use of tuned proprietary fabrics. We don't like to give a distance use for our bib shorts either because they are designed to be used for any rides, every Salopette can be used for a long distance ride, thanks to the construction, the design and the Chamois with its generous proportion and high-density foam. You can read our review of Q36.5's summer clothing here.